A tiny board book for tiny little hands! The Tiny Traveler is a series of board books about various destinations around the world. 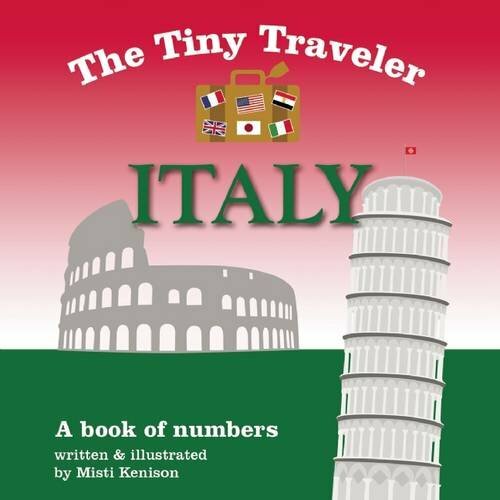 In this Tiny Traveler book we are learning about Italy! This is a very simple board book perfect for little ones learning how to count. I chose to review the Italy version because we have a family member heading to Italy later this year and I thought what a great way for the kids to relate to their grandmother’s travels. Each set of pages has a number with a few descriptive words about a famous landmark in Italy. You start with #1 and end at #10. While your little one is learning to count to 10 he or she will also be learning about famous landmarks like the Leaning Tower of Pizza or the gondola’s that everyone uses for travel throughout Italy. We have a variety of ages in our family from 6 months to 9 years old. For the older children, we can use The Tiny Traveler as talking points. We can talk about the way people travel in Italy when we get to the page with 5 gondolas. Or we can talk about the masks worn at Carnival every year and what Carnival is. Each page is full of relevant facts pertaining to Italy. For the preschooler in our family, we can use it as a book to help him count. He’s learning his numbers so the repetition of going through the book, seeing the number and the pictures corresponding to the numbers will help him learn. And the 6-month-old can enjoy being read to. It’s also a great book to have the 1st grader in our family read to the younger kids. If Italy is not your thing, Tiny Traveler has several other titles like Tiny Traveler Egypt or Tiny Traveler France. I’m so glad everyone enjoyed the books! Thanks so much for the great review!